Teacher, historian, minister, activist, and author Vincent Harding (July 25, 1931–May 19, 2014) passed away this week at the age of 82. Harding may be best known for his work with Dr. Martin Luther King Jr., including co-writing “Beyond Vietnam,” the April 4, 1967 speech King gave at Riverside Church. Harding read an excerpt of that speech for a Voices of a People’s History of the United States performance in Boulder, Colorado in October, 2008. This was the last time that Howard Zinn and Harding saw each other. Their friendship dated back to the 1960s when both were active in the Southern Freedom Movement. Harding taught at Spelman College (after Zinn was fired for his activism), University of Pennsylvania, Temple University, Swarthmore College, and Pendle Hill Quaker Center for Study and Contemplation. He was the first director of the Martin Luther King Jr. Memorial Center and served as a senior academic consultant for Eyes on the Prize. Harding and his first wife Rosemarie Freeney Harding founded the Veterans of Hope Project: A Center for the Study of Religion and Democratic Renewal, located at the Iliff School of Theology in Denver, Colorado. 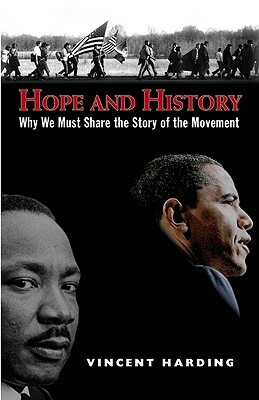 Harding called on teachers to teach the story of the black-led freedom movement in his book Hope and History: Why We Must Share the Story of the Movement. There’s a lesson for us: If we lock up Martin Luther King, and make him unavailable for where we are now so we can keep ourselves comfortably distant from the realities he was trying to grapple with, we waste King. All of us are being called beyond those comfortable places where it’s easy to be Christian. That’s the key for the 21st century – to answer the voice within us, as it was within Martin, which says ‘do something for somebody.’ We can learn to play on locked pianos and to dream of worlds that do not yet exist. Learn more about Harding from his interviews on Democracy Now!